Los Angeles, CA - April 2, 2019 - Canyon Partners Real Estate LLCÂ® ("Canyon") has provided $14.7 million of preferred equity to Bright Realty LLC ("Bright Realty") to finance the ground-up construction of Phase II of The Realm at Castle Hills, a 260-unit, five-story, Class A apartment community with ground-floor restaurant and retail space in the market-leading Upper Tollway submarket of Dallas. This marks Canyon's second investment with Bright Realty in the Castle Hills community, having provided $16.7M of preferred equity last year to finance Offices at The Realm, a 250k square foot office tower immediately adjacent to the apartment community. The Realm at Castle Hills continues Bright Realty's expansion of Castle Hills, a 2,800-acre, award-winning master planned community established by Bright Realty in 1997. When complete, The Realm will include 1.5 million square feet of multifamily, retail, office, restaurant and entertainment space, along with an extensive outdoor entertainment area including a hike and bike trail system, creating a vibrant, urban live-work-play environment. Phase II of The Realm at Castle Hills will offer one- and two-bedroom units with interior finishes including granite countertops, engineered hardwood flooring, and custom lighting. Community amenities include a pool, fire pits, hammocks and outdoor games, as well as a fitness center and community lounge. The first-floor retail offers exceptional State Highway 121 visibility and will feature restaurants and neighborhood conveniences. "The 121 Corridor is considered the new Central Business District of the DFW area," said Chris Bright, Bright Realty CEO. "It's both a thriving center for business development and a lifestyle destination because of its urban feel and amenities as well as its access to DFW Airport." The area surrounding Castle Hills is home to some of the top employers in the Dallas-Fort Worth metroplex, including Toyota Motor Company, Nebraska Furniture Mart, Raytheon Corp. and FedEx Office. "As the area population continues to grow, so will the need for more varied housing types and walkable communities," said Eric Stanley, Bright Realty president and COO. "We are very pleased to extend our partnership with Canyon to complete the cornerstone and second phase of The Realm at Castle Hills," said Stanley. "The team's dedication and experience in creating mixed-use properties will help us deliver a desirable lifestyle-focused community in one of the country's fastest growing job markets." Canyon has a long track record of investing in the multifamily sector. Over the past five years, Canyon has made over $750 million of debt and equity investments in multifamily assets nationwide, supporting the financing of over $2.3 billion of projects. 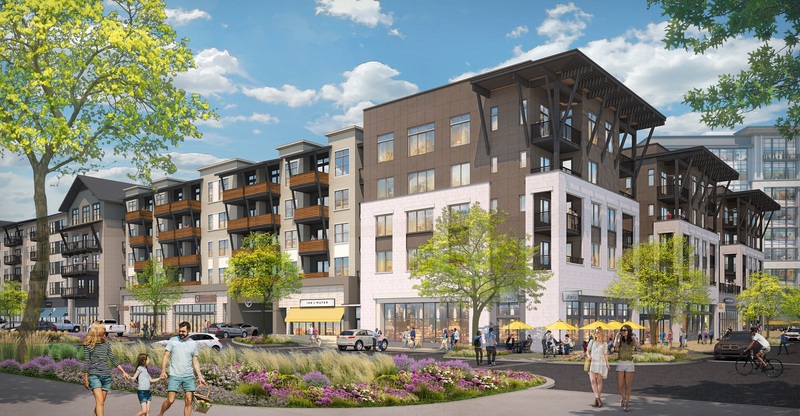 The Phase II architects are 505 Design based in Boulder, Colorado, and BOKA Powell. The landscape architect is Land Design; Andres Construction is the general contractor and BB&T is the lender. Phase II of The Realm at Castle Hill is scheduled to deliver in the Fall of 2020. Founded in 1991, Canyon Partners Real Estate LLCÂ® ("Canyon") is the real estate direct investing arm of Canyon Partners, LLC, a global alternative asset manager with over $24 billion in assets under management. Over the last ten years, Canyon has invested approximately $4.6 billion of debt and equity capital across over 170 transactions capitalizing over $12 billion of real estate assets, focusing on debt, value add, and opportunistic strategies. With 27 years of experience, Canyon has established a broad menu of investment capabilities spanning property types, US regions, and project stages (including development, transitional, and distressed/workouts). For more information visit: www.canyonpartners.com. Headquartered in Castle Hills, Bright Realty specializes in residential and commercial land development, including master-planned communities, office, retail and mixed-use lifestyle centers. The company is a full-service real estate firm offering services such as land brokerage; customized property management and accounting; leasing advisory services; owner and tenant representation; project management; asset disposition; golf course operations; and landscape services. ©2018 BRIGHT REALTY LLC DALLAS ALL RIGHTS RESERVED.